Wordsworth Cottage07761144427work Self-cateringWordsworth Cottage sleeping up to 6 people + cot:- a stylish listed cottage offers spacious, newly renovated and characterful accommodation with all of the essential elements for a Lake District holiday cottage in a stunning location. Offers 4 comfortable and individually decorated bedrooms with en-suite bathrooms, a woodburner, lots of beams, an Aga, oak floors, antique furniture mixed with contemporary bathrooms, sumptuous soft furnishings, great features such as super fast Wi-Fi, 37" freesat HD TV, and a beautiful garden. This very well equipped property has spectacular views of the surrounding fells. The cottage is idyllically located in a quiet position in the picturesque village of Patterdale. It is within easy walking distance of local pubs and shops and only a mile from the shores of Ullswater. The famous Ullswater Steamers operate between Glenridding Pier, Pooley Bridge and Howtown from where you can walk back to the property along the popular lakeshore walk, and attractions such as Dalemain House, Aira Force arboretum and falls, the Kirkstone Pass and Rheged are within a short drive, and of course fabulous scenery is all around! The area has lots to offer - activities such as cycling, walking, sailing, horse riding, country pursuits and outdoor adventure activities are all available locally. Wordsworth Cottage is nestled under Place Fell, which gives access to the High Street range and with Helvellyn close by; there is great walking from the front door and routes for all abilities. You can also follow in Alfred Wainwright’s footsteps – at least 3 of his walks pass through the village. Wordsworth Cottage offers weekly bookings starting on Friday and short breaks of 3 days starting on Friday and of 4 days starting on Monday in some seasons. 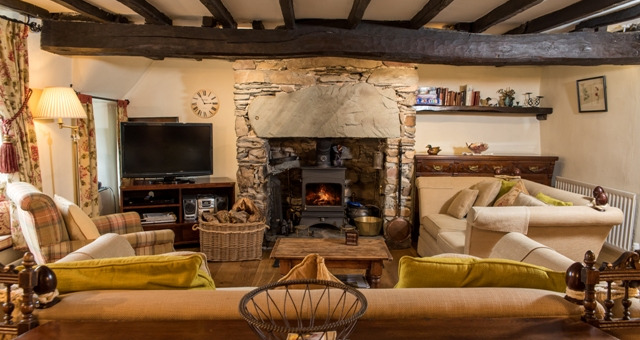 Cottage designed for up to 6 people retains original features throughout, such as extensive exposed oak beams, an inglenook fireplace, and exposed stone. Four bedrooms 2 super king/twin, 1 with en-suite bathroom, 1 double en-suite bathroom and a single room. Luxurious half-tiled bathroom with feature freestanding bath and separate shower with watering can head. 37" Freesat HD TV,DVD, digital radio, WiFi, and CD player. All fuel, logs, electricity, oil and bed linen included. Towels, cot and high chair available for hire. Changeover day Friday, except Christmas and New Year which may vary. Short Breaks, changeover day Friday or Monday. 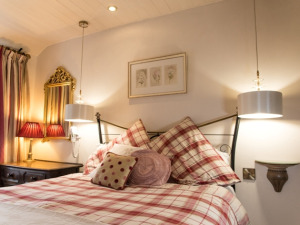 Please note: - at line of enquiry your credit card details will be required to secure your booking only and payment will not be taken by credit card as Wordsworth Cottage does not accept card payments. Please arrange payment directly with Wordsworth Cottage. Wordsworth Cott offers weekly bookings starting on Friday and short breaks of 3 days starting on Friday and of 4 days starting on Monday in some seasons. Wordsworth Cottage is a deceptively large and well-equipped property with a blend of old-world charm along with modern creature comforts. The location is fantastic being a short distance from Ullswater, and the nearby scenery breathtaking. We thoroughly enjoyed our stay in this cottage. Thank you for your very kind compliments and first class reviews. Hope to hear from you in the future. Joan. Wordsworth Cottage sleeping up to 6 people + cot:- a stylish listed cottage offers spacious, newly renovated and characterful accommodation with all of the essential elements for a Lake District holiday cottage in a stunning location. Offers 4 comfortable and individually decorated bedrooms with en-suite bathrooms, a woodburner, lots of beams, an Aga, oak floors, antique furniture mixed with contemporary bathrooms, sumptuous soft furnishings, great features such as super fast Wi-Fi, 37" freesat HD TV, and a beautiful garden. This stylish cottage once owned by the well-known poet William Wordsworth and with links to the arts and craft era is available for short breaks and longer holidays. The perfect retreat! Wordsworth Cottage is double glazing and oil central heating throughout and an additional wood burner. All fuel, (logs, electricity and oil), bed linen and complimentary toiletries provided (Towels available for hire). Wi-Fi, 37” Freesat HD TV, Payphone, Cot and high chair are available. Outside: Off road parking for 2 vehicles (3rd space may be available on request). Front patio, planted with cottage flowers, rear garden - well maintained & established. Lawned garden, planted with shrubs and borders. Seating and barbeque areas (furniture provided). Children welcome from any age. Patterdale is located at the southern tip of Ullswater. Leave the M6 jct 40 and head west on the A66 signposted Keswick. At the first roundabout, Rheged, turn left towards Ullswater A592. Follow this road for 15 miles, signs Ullswater and passing along the shores of the lake to Patterdale you will come to the White Lion on your left after 100 metres, take the road to your left over a bridge, Wordsworth Cottage is 350 metres up on your left. There is a bus service from Penrith (108) that runs between Penrith railway station and Patterdale calling at Pooley Bridge and Glenridding, it runs throughout the year. Times vary with the season. To find the current times please call Traveline on 0870 6082608.